We’re thrilled to once again be showing Rosemary’s brilliant bronze resin sculptures. A member of the Society of Women Artists, Rosemary was born in Portsmouth and after Art School worked as a conservator. After many years working on the restoration of sculpture at the RA, she embraced her own creative urge and embarked on a career as a successful sculptor. 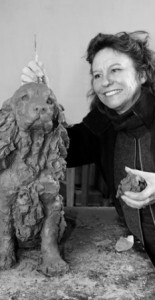 Her bronze resin sculptures begin life in clay before the casting process produces timeless pieces which offer a very special response to her favorite subjects. If you love dogs, Rosemary’s work with many familiar breeds will particularly resonate.